ERGONOMIC EVA FOAM CHEST PLATE - Our ergonomic EVA foam chest plate construction molds to your dog's chest for a custom fit and unequaled comfort. 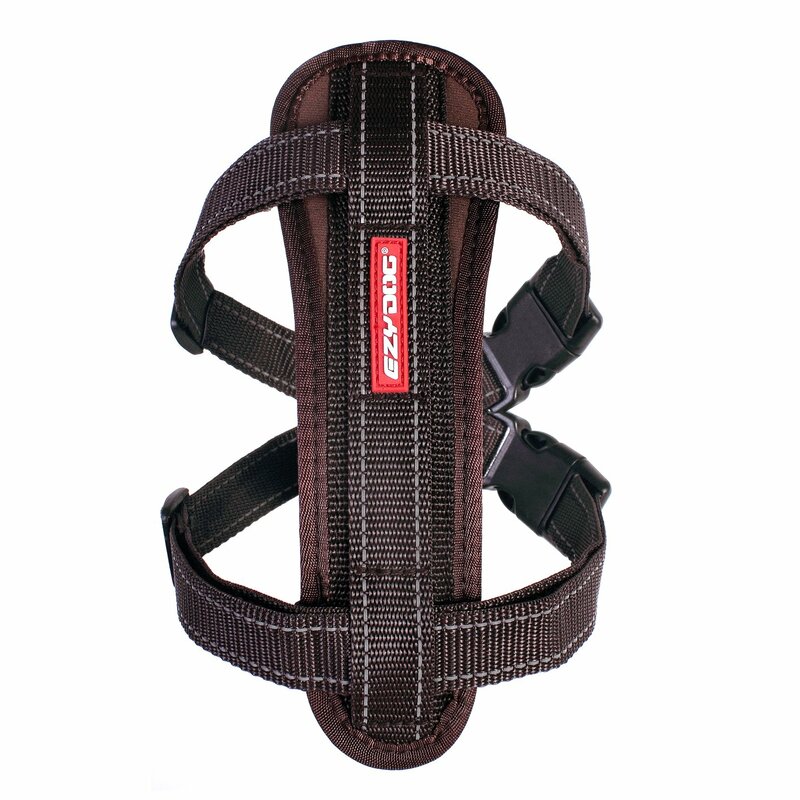 Our unique design disperses the load vertically for a greater level of control over traditional harnesses. REFLECTIVE STITCHING THROUGHOUT - We've incorporated high-visibility reflective stitching in our award winning design to increase nighttime safety for both you and your dog. STAINLESS STEEL D-RING - Our award winning design includes a rustproof stainless steel welded D-ring leash attachment for the ultimate strength, durability, and security. FREE BONUS GIFT: CAR SEATBELT RESTRAINT CLIP - Keep your dog in place and secure while driving and minimize distractions. The included seatbelt restraint attachment gives your dog some freedom of movement and allows them to sit or lay down comfortably. The award winning Chest Plate Harness by EzyDog incorporates a unique design and materials to create the best in fit and function for both hard pulling and active dogs. EzyDog Chest Plate Harness sizing chart. The EVA Chest Plate forms to the dog's chest for a custom fit. It provides a vertical load dispersement; which provides greater control than a traditional harness. The fit of the harness makes backing out of the harness extremely challenging for most any dog. Reflective trim allows for night time visibility and the included Seat Belt Restraint keeps your pup restrained in the car. The Chest Plate Harness is the perfect dog harness for training, walking, running and cycling. The added control and comfortable fit allow for ease of movement and more enjoyable outings. Ergonomic EVA chest plate forms to your dog's chest for a custom fit. Easy to adjust straps create a snug, secure fit. Reflective stitching provides enhanced nighttime visibility. Sturdy clasps make putting it on fast and easy. A rust-proof welded D-ring for leash attachment. Very difficult to back out of. So many colors to choose from. Seat Belt Car Restraint Included.